Much like The Sims and Tiny Tower before it, Fallout Shelter is a micromanaging simulation game. Announced and released during Bethesda's first E3 event, Fallout Shelter serves as an appetizer for all the souls (with iOS devices) yearning for Fallout 4 this November. While it may only resemble Fallout in style, it does carry the quality you'd come to expect with the namesake. And it's free, so what have you got to lose anyway? I was painfully addicted to Fallout Shelter the entire first week I played it. Naming characters, assigning them jobs, boosting their stats, putting them into tiny little outfits, and sending them out into the nuclear wastelands to scavenge for goods were all things I looked forward to doing every time I had a spare moment. Balancing their happiness, food, water, electricity, money, and living arrangements is a breeze, and I was eager to hop in seconds after seeing that something in my vault was ripe for consumption. So much so, that I would sneak in moments to check on my miniature collection of dwellers at least twenty times on a given day. Indeed, Fallout Shelter feeds upon the lust for notification induced dopamine benders and is quite the pleasant surprise, at first. A vault ripe for harvesting. 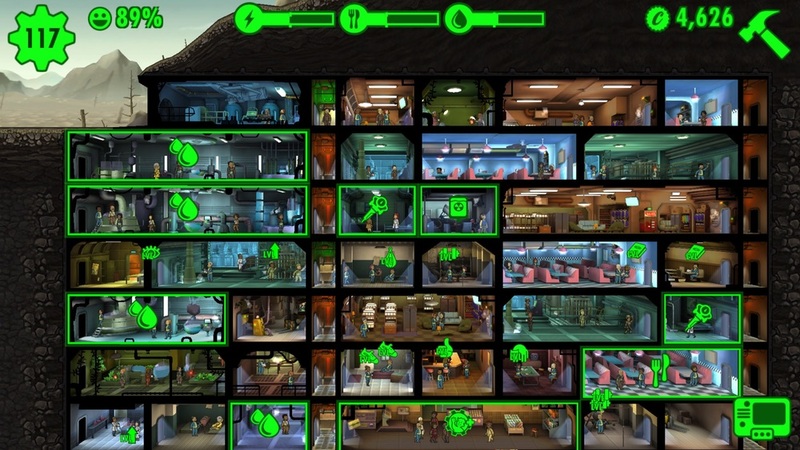 The action in Fallout Shelter is all centered around your vault. It’s your campus of the living, and can be carefully constructed and upgraded for maximum efficiency. All of the actions revolve around one universal currency (bottle caps in this case) and many of them require time to pass in order to achieve results. Production can be rushed at risk of causing your dwellers harm, or resource deprivation. All in all, I rarely felt as though I had put my dwellers in a situation that was not sustainable and was breezing by in a matter of hours. There are new and seemingly random challenges to help reward you along the way with caps and lunch boxes that contain all sorts of goodies from weapons to dwellers themselves. The boxes help speed things up, but are not always vital to progress. They are also the only micro-transaction that is available, and never necessary nor forced upon you in order to advance. Fallout Shelter gets several thumbs up. In totalilty, Fallout Shelter is not a never ending pool of delicious cuts of meat. However, it is an incredibly fun stint set in the Fallout universe. I could see myself making another vault in the future and enjoying it all over again, but will probably burn out once more with it's current stack of content. I would’ve gladly paid to have the amount of fun I had playing Fallout Shelter, and hope they offer some additional content to keep things interesting in the future. Fallout Shelter earns itself a Coolguy Jiones on the Game Awry Review Scale, and comes close to being one of the most addicting games I’ve played on a smartphone.